ContiTech is presenting climateneutral printing blankets that are unique worldwide € Waterless offset printing improves quality and environmental protection € New printing blankets for special applications in offset, spot varnishing and rotary newspaper printing. Welcome to the "green" future: At IPEX 2010, which runs from May 18 to 25, 2010, in Birmingham, UK, ContiTech Elastomer Coatings (booth 20-D630) will be showing off its expertise as a competent technology partner and producer of nextgeneration printing blankets. With its two brands CONTI-AIR® and PHOENIX Xtra BLANKETS, which are marketed worldwide, the company is demonstrating its wideranging competence in the field of offset printing. 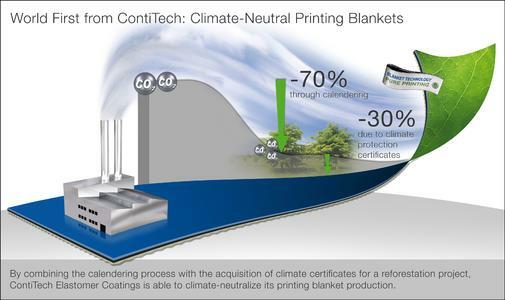 ContiTech is the first manufacturer anywhere in the world to climateneutralize its printing blanket production. A new kind of manufacturing process eliminates up to 70 percent of the climatedamaging CO2 emissions released in the production of world standard printing blankets. ContiTech offsets the residual CO2 emissions by supporting a reforestation project in Panama, for which it acquires climate protection certificates. Enhanced climate protection thanks to calendering technology The calendering process used in making the printing blankets is chiefly responsible for the CONTI-AIR® HC line's small carbon footprint. A steel roller forms the rubber into a slab of the requisite thickness. This is a much more energyefficient approach than the conventional coating process. What is more, solvent additives can be dispensed with. To neutralize the remaining CO2 emissions, ContiTech acquired climate certificates from natureOffice, a climate protection agency. In so doing, ContiTech supports a reforestation project in Panama that benefits not only nature but also those living in an economically underdeveloped region. 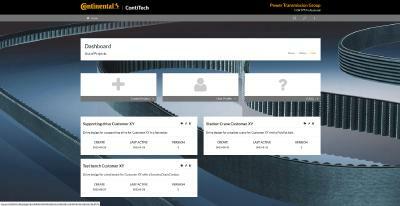 Products from ContiTech AG, the world's largest rubber and plastics technology specialist, are designed to meet today's challenges. Within the scope of its involvement with the printing industry, the company is therefore also an active member of the European Waterless Printing Association (EWPA), which has set itself the task of promoting research and development in the field of waterless offset printing in order to avoid the use of fountain solutions and to protect the environment. 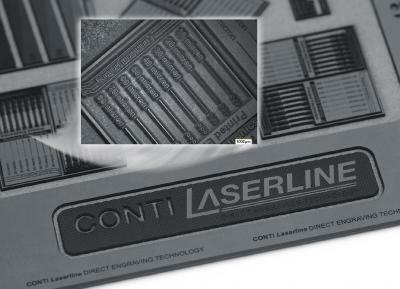 The CONTI-AIR® Steel CE 50/51 for metal printing, for example, is a proven option in keeping with the CONTI-AIR® "Print to perfection" philosophy, as a solution for waterless newspaper offset printing. This printing blanket delivers convincing performance in terms of excellent color rendition, maximum precision and high print quality. Fully in line with their motto "Your needs first", the PHOENIX Xtra BLANKETS brand - which belongs to ContiTech - is showcasing three new printing blankets: Journal, a blanket for highspeed rotary newspaper presses, Xtra Sticky for special applications in offset printing, and Xtra Spot, the reusable varnishing blanket for spot varnishing applications. Journal, the first newspaper printing blanket from PHOENIX Xtra BLANKETS, is ideal for modern satellite newspaper printing machines as well as for the classic fourhigh towers. Featuring two hydrophobized carcass fabrics, a highly resistant printing blanket surface and optimized neutralnegative paper transport properties, this printing blanket guarantees stable and reliable production conditions. The Xtra Sticky printing blanket was developed on the basis of the PHOENIX Xtra BLANKETS technology and features a special selfadhesive layer for special offset applications like continuous form or envelope and label printing. This new kind of adhesive technology enables tight thickness tolerances, outstanding adhesion, and blanket removal from the cylinder with no adhesive residue. For UV- and waterbased spot varnishing, ContiTech Elastomer Coatings has developed Xtra Spot, an optimum reusable varnishing blanket which - thanks to its elastic polyester back - remains dimensionally stable and guarantees smooth, precise separation. The varnishing blanket boasts an enormous stencil depth and, thanks to its extremely flat ground surface, guarantees a clear and smooth varnish coating combined with extremely reduced ink buildup. Working together as partners, ContiTech Elastomer Coatings and the Swedish company NIP CONTROL have developed a world first - a system capable of measuring compressibility in the nip zone between the plate and rubber blanket cylinder in offset printing. This digital pressure indicator measures the maximum pressure in Newton per square centimeter at the printing nip between the cylinders, thus enabling the printer to adjust the printing process more reliably. So far there has only been an indirect method by which the height of the rubber blanket or the printing plate could be measured, which meant that the compressibility of the rubber blanket was not taken into consideration.